← Happy Australia Day as Australian Census Campaign Launched! Are your answers on the Census confidential and safe? While out campaigning, a number of people have asked about how safe their data will be. “If we tick ‘No Religion’”, we’ve been asked, ‘will that damage my child’s chances of getting into a faith school, if those are the only schools in my area?’. Another consideration for the less outspoken non-religious person is whether family and friends will be able to learn your ‘real’ views if you tick ‘No religion’. The answer to this is ‘No’. Your answer to the religion question – and all personal information on the Census – is thoroughly protected by a number of different laws, including the Data Protection Act of 1998 and the Census Act of 1920. No personal information can be shared for 100 years, and all analysis is at a group level. You can, then, feel safe in the knowledge that your data is securely locked away and inaccessible to prying eyes. No personal census data will be handled or seen by any American-owned company… All data processing will be carried out in the UK and no data will leave or be held outside the UK. The data are the property of ONS and only UK/EU owned companies will be involved in processing personal census data. So, if you aren’t a ‘shout it from the roof’ kind of humanist, you don’t need to worry about your personal data: it should be thoroughly protected by the UK laws. Of course, we think that ticking ‘No religion’ could help to tackle problems like worrying about ‘faith’ schools admissions from the start. Census data on religion is often used to justify public policy – including building more ‘faith’ schools in response to perceived need of religious groups. The more people that accurately report themselves as having ‘no religion’ on the Census, the less justification for building more ‘faith’ schools, and so the less need in the future to obscure your view on religion. As an aside, surveys show that only a minority of adults who practice their religion say that this influences the school to which they sent or would send their child. See government stats (PDF) and the YouGov poll (PDF). Thanks to Jeck Crow for the image “Faith”, used with permission. 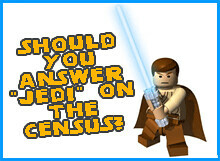 2 Responses to Are your answers on the Census confidential and safe? The statements that personal information will be securely locked away for 100 years and thoroughly protected by UK laws aren’t quite right. The Statistics and Registration Services Act 2007 allows the Statistics Board to disclose census data amongst other things “in pursuance of an order of a court” and for “the purposes of a criminal investigation or criminal proceedings (whether or not in the United Kingdom)”.